Combo comes with 35 lbs. wing, tank bands, LP hose,Golem Stream backplate with Hog harness, crotch strap and FREE harness knife. Technical wing for single tank configuration. Rock solid construction. Streamlined for effortless swimming, low drag for scootering. These wings are designed specifically for use with single cylinders. They provide 35 pounds/18l of lift. They are designed for use with Aluminium and Steel single tanks. A 24-inch/60cm low-pressure inflator hose is included. Available in Black. Technical wing for single tank or CCR configuration. Rock solid construction. Streamlined for effortless swimming, low drag for scootering. 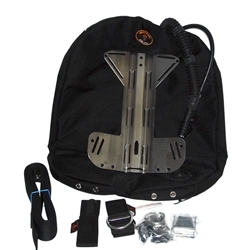 Technical wing specifically designed for rebreathers. The wing is shorter to prevent pinching at the bottom of the cannister and wider to ensure full inflation away from the stack and backplate, while tapered at the bottom to allow easy access to tank valves.. The wing has been redesigned with slots to ease hose and cable routing. This wing is ideal for use with rebreathers. Its simple, streamlined design paired with low profile Golem Stream backplate creates unbeatable CCR kit. Rock solid construction. Streamlined for effortless swimming, low drag for scootering. U-shaped. 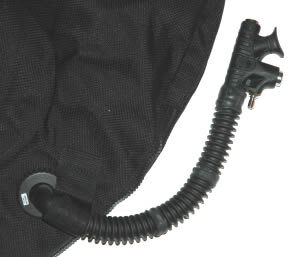 lowest grommet hole to bottom of hose cutouts 2"
These wings are ideal for use with rebreathers. The simple, streamlined design paired with low profile Golem Stream backplate creates unbeatable streamlined single tank kit. The Golem Stream backplate comes in Regular Profile shape (same as any other backplate) or in Reverse profile (pictured below) with an channel along the center of the BP. The chanel serves as an STA. Reverse profile Stream BP has 4 cam band slots in three rows for ultimate flexibility in configuration. holes at the bottom of the Backplate accomodate the ArmadilloCCR sidemount kit. Argon bottle can be attached to the the holes on the edges of the BP. Select correct Backplate profile below. This stainless steel backplate weighs only 2 lbs. It's unique reversed design will accommodate rebreather scrubber canisters as well as single tanks without the need for cumbersome and redundant adapters (STAs). Can be quickly mounted with a pair of cam bands and will accommodate the Golem Gear Armadillo CCR and/or any brand of buoyancy wings. The BP is 15 inches long by 11 inches wide. Add our backplate pockets (below) for a complete package. Virtually indestructible. High quality Swiss RiRi zipper. Two cam bands with stainless steel buckles are included with each wing. 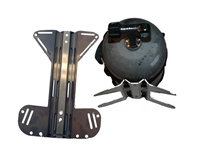 Two backplate attachment SS bolts and nuts are also included. I just received this package. The wing is nice. However it provides 40 lbs. of lift, not 35 lbs. of lift as stated on the site. The wing is made in Czech Republic, the inflator is made in Italy. The inflator is burly, feels nice. 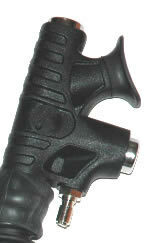 The corrugated inflator hose is short, this inflator will ride on your shoulder “tech style”. Short low pressure BCD hose is also supplied (nice). The wing has a dump calve with a string, cave style. The cordura fabric is beefy. The label says max. tank size is 104 cubic feet. Golem Stream backplate reverse profile is made of 1.4 mm stainless steel (SS). It sees flimsy to hold a 104 cub. feet tank, the most I would put on it is AL 80 cub feet tank. The edges on it are sharp, you need to take a small file, and gently file away the sharp edges. Do this, before you thread the harness. It comes with 2 SS screws, and wing nuts to attach the wing. The harness webbing is tough. I guess it needs to be to survive threading through all the slots with sharp edges. It may be too tough, and inflexible. Anyhow, I think I’ll replace it with 2 inch webbing from the local dive shop and put on sleeves on the webbing where it goes through the slots, DiveRite style- to prevent damage to the webbing from chaffing. Crotch strap is supplied. Threading of this harness begins on the front, because with the reverse profile, the tank sits on the back. This is reasonable value, I hope it performs in the water. 40 lbs. of lift will be fine for drysuit diving, I wanted something light for warm water travel, so I would have preferred 35 lbs. wing. I don’t kow about using the Stream backplate. I will definitely take it warm water diving, after I am happy that all the sharp edges are gone. But the plain old backplate with STA provides just enough weight, that I may only take 4 additional lb. of lead – comfort in warm water. The little “hog knife” is cute, but carry a backup like shears.